So, Bella and Edward are happy, life is as normal as it gets, but then on Bella’s 18th birthday, at the Cullens’ place, Bella gets a paper cut. Nothing big, but they are vampires, so Jasper starts… trying to, like, attack her, so Edward gets all defensive, and shoves Bella out of the way, and she falls into these glass plates or something, and there’s glass stuck in her arm and her blood is going everywhere, so of course, all the others, including Edward, excluding Carlisle, start running out the room so they don’t attack Bella. Carlisle is a doctor, so he fixes Bella up and Edward takes Bella home. On the drive back to Bella’s place, Edward is really quiet. Bella goes, did I make you mad? Edward gets really angry at this point, telling her that it’s all his fault, and Mike Newton would be healthier for Bella, and he should be stronger, and he’s basically blaming his existence, because he’s being quite pessimistic and being, like, it could have been so much worse, and I’m not healthy for you. He also refuses to stay with Bella, and goes away that night. Okay. Umm… honestly, this was the slowest and most boring of the saga; I had trouble getting through it, and it’s definitely my least favorite. It moves really slowly, and it’s just not as gripping as Twilight. I was a bit annoyed when I read it, as I was getting all, like, oh-i-can’t-wait-for-the-next-book and then New Moon comes out, and I’m just bored. Ages… 12ish, again, I think. The third in the saga is ECLIPSE. The movie for New Moon is out. 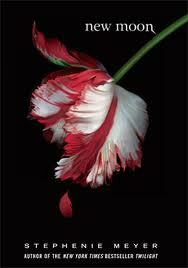 It’s the first of the Twilight Saga by Stephenie Meyer. It’s in the POV of seventeen-year-old girl Bella Swan, who is leaving her mom in sunny Phoenix to live with her dad in rainy Forks. She’s doing this because her parents have split up, and her mom’s in love with someone else- a man named Phil. He’s a baseball player, and he moves around a lot, so Bella decides to leave her mother and Phil and live with her dad for a while. Bella doesn’t really want to go, but her dad really wants her to come so she goes. So, at lunch, Bella notices a group of people sitting at a table in the corner, and they intrigue her. They all have the same air around them; they all share ghost-white skin, purplish shadows around their eyes, and they are all devastatingly beautiful. Asking her friends about who they are, Bella learns that the more beautiful of the two girls is Rosalie, with long blond hair, and the other is Alice, with short, spiky hair, who is the smallest. There are three boys there as well; Jasper, the curly blond who looks like he is in pain, Emmett, who is the biggest of them, and the one who intrigues Bella the most: Edward Cullen. Why are the Cullens so different? They are vampires. But what happens when Bella falls in love with one of them? This book is… good, I guess. I think Stephenie Meyer is an AMAZING author, and the books are really gripping, but I’m not a huge fan of the plot- it just seems a bit silly to me, if you look at it. A vampire and a human fall in love, get married, and have a half- vampire, half- human kid. Basically. But it’s a good series. Ages… 12ish? 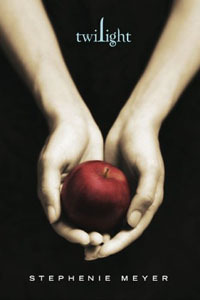 For this book, there is a 12- chapter draft of Twilight in Edward Cullen’s POV, called Midnight Sun. You can find it on Stephenie Meyer’s website.